Ullswater ‘Steamers’ is gearing up to ‘pipe’ their first customer aboard in the aftermath of storms ‘Desmond, Eva and Frank’ later this week. Despite a number of recent setbacks due to the severe weather experienced during the Festive period the iconic Lake District attraction is set to bounce back and offer cruises on England’s most beautiful lake, Ullswater, commencing from Thursday 14 January 2016. 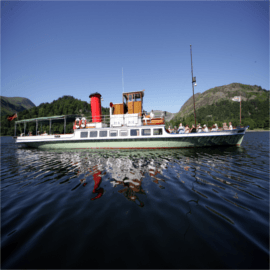 (First sailing departs 09.45hrs from Glenridding Pier). Despite the area being subjected to three Storms in rapid succession the team at Ullswater ‘Steamers’ weren’t going to be kept down. Like many businesses in and around the Lake the team from ‘Steamers’ mucked in and helped local communities around Ullswater where they could, clearing away debris, ferrying supplies about and generally doing their best to ease the plight of those worse off than themselves. ‘Steamers’ fortunately got off relatively lightly at the hands of ‘Desmond, Eva and Frank’, with some damage caused to the stern of Lady Wakefield, flood damage to facilities and the carpark at Glenridding, minor damage to Pooley Bridge Pier and Pier House, and difficulty accessing Howtown due to high lake levels. To further support the local communities affected by flooding ‘Steamers’ are offering the residents of Glenridding, Patterdale, Martindale, Howtown and Pooley Bridge a complimentary season ticket giving unlimited travel on scheduled services for 2016. The business, which operates one of the largest heritage vessel fleets in the world, is an important link in connecting some of the most famous and iconic walking routes in the National Park and as such is a vital part of the local tourism infrastructure. Mindful of this the team wanted to get services up and running as quickly as possible, to show that the area is open for business despite all that has been thrown at the area by the recent storms. Tour groups wishing to access ‘Steamers’ sailings from Pooley Bridge can still do so at the normal drop off point at Pooley Bridge Pier, which is totally operational. It should be noted that access to refreshment facilities in the Village of Pooley Bridge is currently not possible, as a result we are recommending tour groups use the following facilities as alternatives in the interim, for the northern end of Ullswater – Dalemain and Rheged. Those seeking refreshments at the southern end of Ullswater should note Glenridding is open as usual.